Congratulations. You’ve made the decision to go to a trackday (or even a race). As we, the Motorcycle.com staff can tell you, it’s one of the best decisions you can make with your motorcycle. Not only is track riding fun and addictive, but it’s also a great environment to improve your skills. But there’s a lot to do to get ready, like getting all your gear in order. Most important, of course, is your helmet. Do you have a proper track helmet? 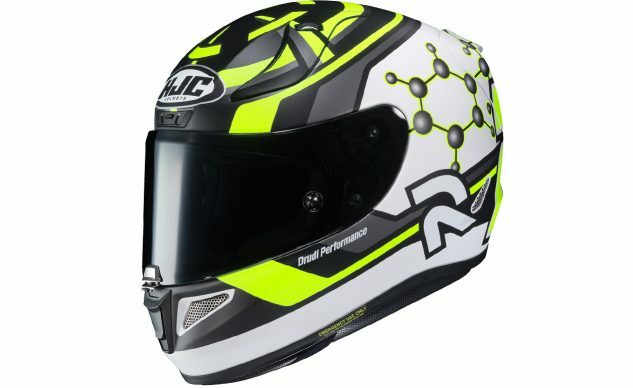 Generally speaking, a good helmet for the track is full-face, with a double D-ring closure, and meets (or exceeds) all federal safety guidelines. You’ll have to consult with your local track or track/race organization for the specific helmet regulations they require, but the following selections are helmets we know will easily pass any tech inspection held anywhere in the US of A, and probably the rest of the world, too. 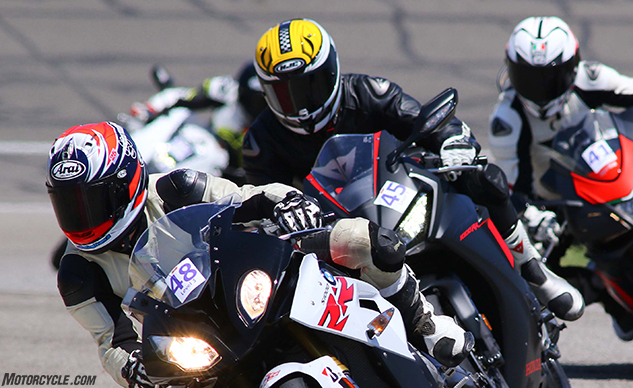 Presented alphabetically, here are some of our choices for motorcycle helmets for track use. Though we’ve never crashed in the ATS-1, we’ve come away impressed in our own experience with it. 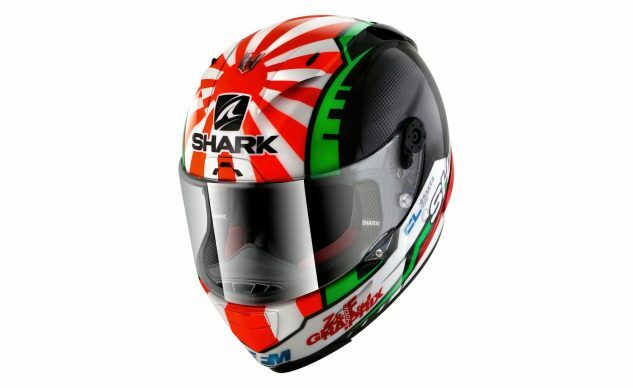 The flagship helmet in the Arai line, the Corsair-X is the same helmet you see all of Arai’s premier athletes wearing – from Jonathan Rea in World Superbike, to Maverick Viñales in MotoGP. With that being said, all Arai full-face helmets are made to the same safety standards. This means certifications like DOT and Snell are just the starting point. Each Arai incorporates the R75 shape, which as Arai explains, means the shell of the helmet has a continuous curve radius of at least 75mm. Arai says this means better dispersal of kinetic energy and minimizes “the potential for the helmet to catch on rough surfaces or obstacles, which may introduce unwanted rotational forces.” From a very basic construction standpoint, Arai helmets feature an EPS liner with a polycarbonate exterior shell (much more detail about Arai’s construction can be found here). The differences come by way of fit (long oval, round oval, or intermediate oval), ventilation, and slight aerodynamic changes. 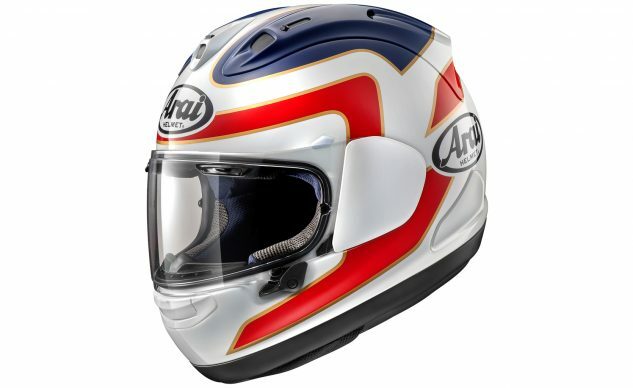 All Arai models allow for micro adjustments by simply peeling away layers of the inner liner. Arai takes pride in the fact every single helmet it makes is handmade by skilled technicians who train for years, sometimes decades, to be the chosen few on the final assembly line. 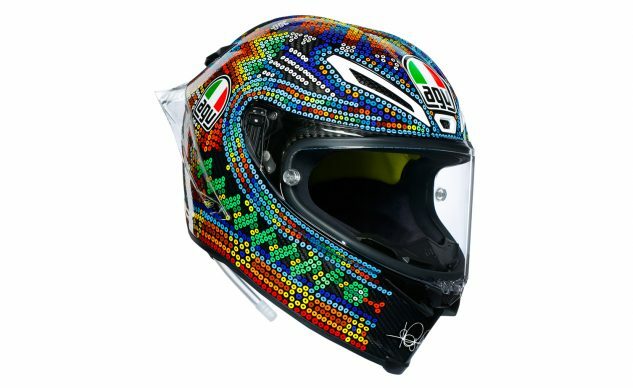 With the Corsair-X specifically, ventilation is everywhere compared to the other Arai models. Two channels run the length of the helmet along the top, with a third intake vent in between. Brow vents and a chin vent, with interior channels running along the inner liner, provide direct airflow to the wearer’s head. Lastly, the Arai faceshield may be less intuitive than the others listed to change, but once the procedure is mastered, it’s one of our favorites due to its smooth operation. If you don’t know who he is yet, you will after your first trackday. Valentino Rossi is perhaps the biggest name in motorcycle racing. The helmet on his head? 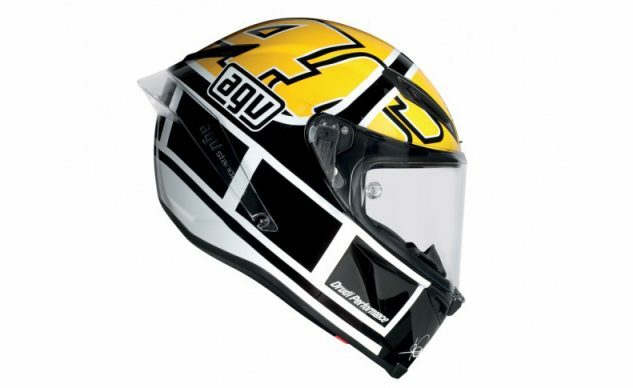 The AGV Pista GP R. Granted, he has a small ownership stake in the company, but the fact remains the Pista GP R is AGV’s top-of-the-line track helmet. The Pista GP R shell is constructed entirely of carbon fiber (not just a carbon outer layer like some other companies) for ultimate weight savings. More importantly, each of its four available shell sizes receives its own dedicated EPS liner for supreme fit and comfort. There are seven sizes, from XS to XXL, including MS (medium-small) and ML (medium-large), the former getting its own dedicated shell while the latter shares its shell with the standard L helmet. The Pista GP R comes equipped with a long, dual-plane rear spoiler to help reduce turbulence behind the rider’s head. Computational Fluid Dynamic (CFD) simulation software was used in conjunction with wind-tunnel testing for aerodynamic purposes, not only to slice the cleanest hole through the air – AGV claims a 4% aero improvement over the Pista GP – but also to help keep the rider’s head stable even while turning their heads at high speed. In the event of a crash, the spoiler is designed to snap off easily. Offering a 190º horizontal, and 85º vertical field of view, the eye port is huge and the 5mm thick visor is one of the thickest around. The AGV Corsa R is like the fraternal twin to the Pista, except instead of carbon fiber, its shell is constructed from a carbon, Kevlar and fiberglass composite, making it slightly less expensive. Also, the Biplano rear spoiler seen on the Pista GP R is gone, replaced with a more sensible, though slightly elongated, rear spoiler. Lastly, the Corsa R doesn’t see the scooped chin vents its MotoGP brother has, nor does it get the hydration system. Otherwise, the Corsa and Pista are identical. In fact, AGV says the Corsa R is slightly lighter than the Pista GP R due to the latter’s hydration system. 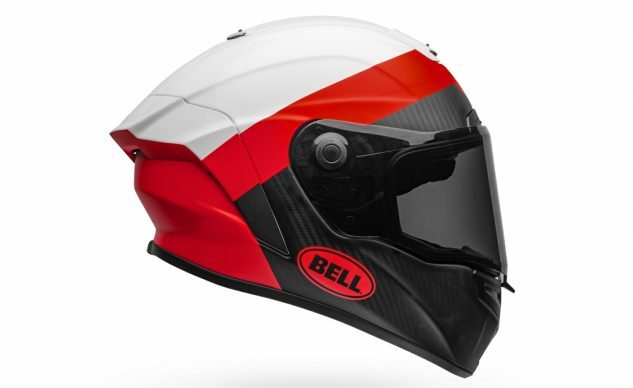 One of the most recognizable names in head protection, Bell is probably the name your parents remember when they got started in motorcycling. With the Bell Race Star Flex, you have the company’s premier track helmet. Utilizing a carbon fiber shell, the Flexx liner is a three-layer impact liner designed to manage energy from three potential impact scenarios: low, mid and high-speed. The Virus CoolJade liner and Magnefusion cheek pads ensure superior comfort and optimal fit, and RaceView orientation capped with the class 1 optics of Bell’s Panovision face shield affords you a perfect view of the finish line. HJC’s premier offering when it comes to track helmets, the RPHA 11 is shaped for intermediate oval heads and offers improved aerodynamics compared to the RPHA 10 it replaced. A composite shell features a myriad of vents, including two top vents, a forehead vent, and a chin vent. The shield is easily changed without tools, and the clasp at the front of the shield provides a positive lock when closed. A moisture-wicking, anti-microbial inner liner keeps you cool and fresh, and quick-release cheek pads make it easier for emergency personnel to remove the helmet. The eyeport is bigger than before, with a fog-free shield to keep your vision sharp at all times. The RPHA 11 is DOT and ECE approved, and is available in XS-2XL sizes. The finest in German helmet technology, the Schuberth SR2 is the company’s raciest, track-focused helmet. Schuberth takes great pride in letting you know they spent a lot of time in the wind tunnel to optimize the aerodynamics of the helmet not just for optimum air flow with minimal turbulence, but also to keep the rider as comfortable as possible – because a comfortable rider is a focused rider. The 2D class 1 visor has the highest optical rating you can get, is fog-free, and is suitable for tear-offs. The $299.95 Scorpion EXO-R2000 is noteworthy because it offers many of the same features of the other helmets on this list for a fraction of the cost – and if you opt for a solid color it’s even less. Four different shell sizes are available, constructed from a lightweight composite with dual density EPS. Like the other helmets here, the visor can be quickly changed without tools and has an anti-fog coating. In fact, Scorpion will even throw in a dark visor along with the clear one upon purchase. Aero-tuned ventilation provides air flow to the head while riding, and the quick-release cheek pads make it easy for medics to take off the EXO in an emergency. A feature unique to the EXO-R2000, however, is the Air-Fit system in the cheekpads. Basically a mini air bladder, it allows the wearer to inflate the cheek pads for optimum fit. 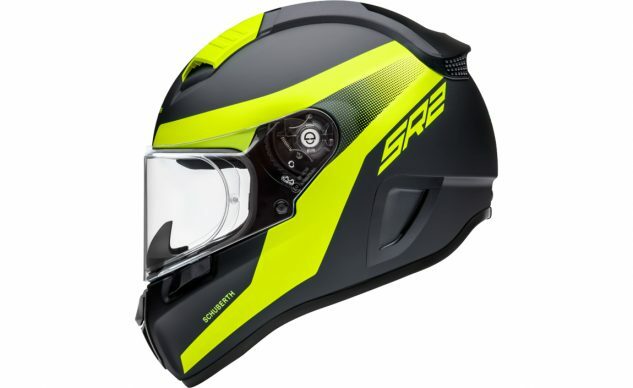 France’s entry into the premier helmet world, the Race-R Pro is a composite fiber helmet that, as Shark puts it, is reversed engineered to fit as close as possible to the human head. Aerodynamic testing with the top MotoGP and World Superbike riders have resulted in a helmet that remains steady even at speeds close to, and exceeding, 185 mph. There are four air scoops, seven extractors, three positions for the faceshield, and two different shell sizes. Unlike other shields here, the Shark shield is a varying density unit measuring 3mm at its thinnest point, up to 4.25mm at its thickest. Of course, it’s treated to an anti-scratch and anti-fog coating. The antibacterial liner is removable and washable, with interchangeable cheek pads offering customized fit. ECE 22.05 and DOT approved. 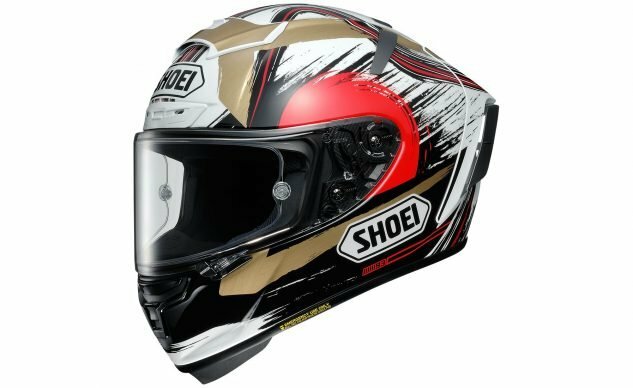 Shoei’s premier racing/track helmet, the X-Fourteen, is the same helmet the Marquez brothers – Alex and Marc – wear on their heads. As you can see from its shape, aerodynamic testing heavily shaped the 14’s form to provide optimum stability at high speeds. The same aero testing also influenced the ventilation channels of the helmet to help keep the rider’s head as cool as possible under the pressures of track riding. Four shell sizes are available, constructed from a six-ply matric of fiberglass composite materials, with a dual-layer, multi-density EPS liner offering multiple zones of protection in a crash. Like other helmets here, the X-Fourteen features emergency quick-release cheek pads. Speaking of the cheek pads, the moisture-wicking inner liner features a patent-pending rotating component that allows for a greater upper field of view when tucked. Optional sizes of each section of the center pad allow for a customizable fit. 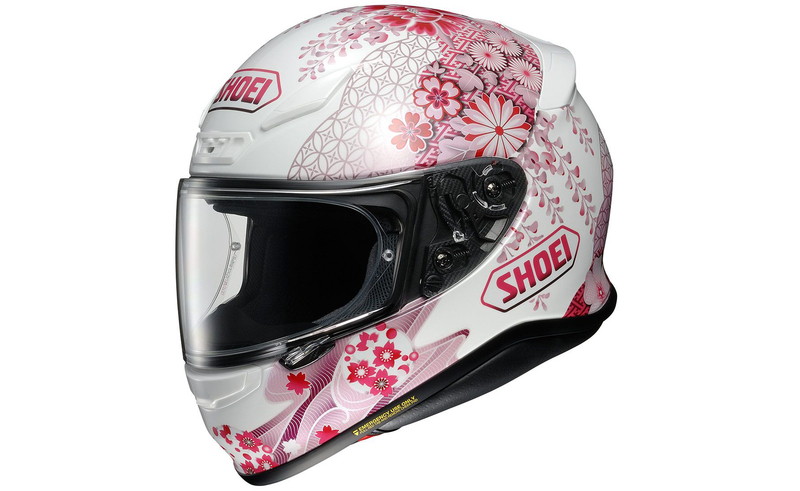 While Shoei touts the RF-1200 as its premier road helmet, plenty of riders wear the 1200 at the track. Construction-wise it’s very similar to the X-Fourteen above, with a more long-oval shape compared to the intermediate-oval X-Fourteen. Some key differences include a less track-focused aerodynamic shape, different ventilation ports, and slightly tweaked interior linings to make for a quieter helmet compared to the 14. The helmet’s smaller opening and closer fitting comfort padding helps reduce wind noise. Ribbing at the top and bottom of the visor helps reduce deflecting to keep the visor’s shape, and it’s also interchangeable without tools, just like the X-Fourteen.